I can’t tell you how proud I am of my friend Lori, whose wonderful book about her open-hearted approach to open adoption is finally available! Seriously, this book is wonderful. More than a “how-to” manual, it gently guides the reader to his/her inner compass towards an open heart, which is essential for true openness in adoption — and by “openness” I mean of heart and mind, and in spirit. It shows how openness is not merely about the exchange of information or extent of contact; it’s about connecting through love for a child. Through first person perspectives and invaluable storytelling, it demonstrates why and how openness benefits adopted children and their families. The book shares with truth and candor how families can and do extend and blend beyond blood to include the bonds of love and trust. If you are considering adoption (domestic, foster or international), if you have placed a child for adoption, if you or someone you love has adopted or placed a child, or if you work with people considering adoption, please consider reading this important book. Because it focuses on openness in spirit and approach, it is relevant even for those building families through donor gametes, where biology is not shared among parents and children. 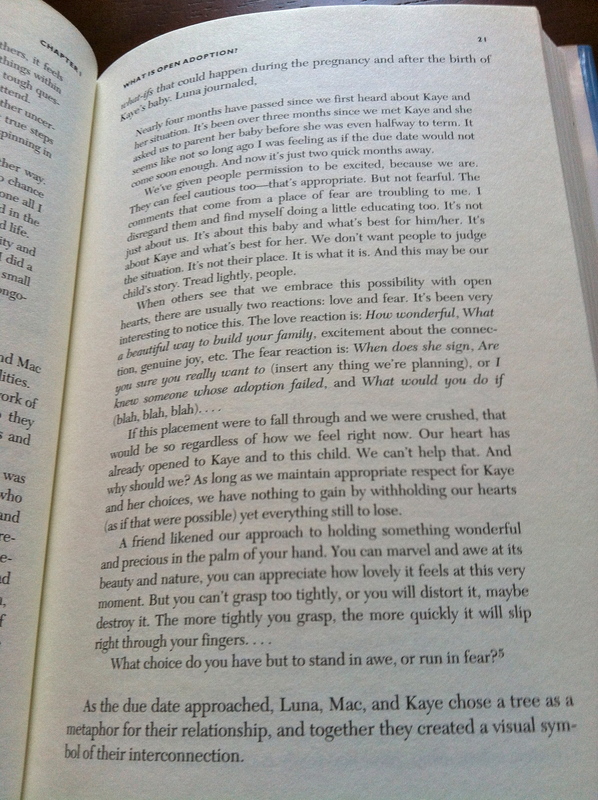 I seriously think this book is a must read for anyone connected to adoption. I only wish it had been around about five years ago when I started reading everything I could about openness. I would have devoured it! Lori has been hard at work on this for a long time. I know this because she interviewed me 3.5 years ago, after we granted permission to share part of our adoption story. Along with many other poignant stories, ours is featured as an example of how to cultivate a genuine spirit of openness in adoption. I think it’s appropriate that this particular excerpt from Chapter One, from a post written four years ago, was about love and fear. I literally opened the book the moment it arrived and opened to this page. When I tweeted this, Mac laughed because we both know it wasn’t the act of seeing these words in black and white that made them “real.” Certainly living them was The Real Thing. Writing those words the first time was Real. Reading them again now? Well it seems like a lifetime ago. But deep down I know that everything I processed here in these pages, all that thinking and writing and sharing and dialogue helped build the foundation for my approach to openness and parenting in a very open adoption. Reading Lori’s words helped shape that approach too. We are so honored to be included in this fantastic collection of family stories about openness in adoption, this wonderful guide to opening your heart to act from love rather than fear. Bravo Lori, and kudos to you, my friend! Well done. There have been a wonderful flurry of bits about a recent New York Times article about the significance of storytelling in families. As personal bloggers, I think most of us can appreciate the value of telling our stories. It’s cathartic and therapeutic. It helps us process and make sense of life events and challenges. Sharing connects us to others with similar experience. Documenting our stories leaves a mark, perhaps even a signpost for those who might pass through later. We also know that storytelling can enrich the lives of children, cultivating imagination with a sense of wonder. It sparks creativity with visions of worlds beyond their own. In our family, we tell a lot of stories. We tell stories at the table, in the car, on long walks, at bedtime. 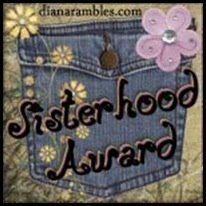 We talk about how each of our girls came to be with us and how we came to be with each other. We weave in key characters, like Jaye’s birth family members, acknowledging their place in our family. We talk about those no longer with us. And we make room for new stories, every day. With adoption, this notion of telling stories is critical. I think it’s fundamental to our daughter’s well being — i.e., her sense of belonging, of knowing who she is and where she came from and how loved she is by all. Jaye in particular comes from a long line of very strong women and she holds a significant place in her family of origin as well as her family through adoption. The act of listening, of telling and re-telling our family story is how she may begin to integrate her personal story — which inevitably diverges from ours because it is hers alone. Telling her story is how I hope to help her feel whole so she never has to choose one part of her life over another, or what my friend Lori calls her biology and biography. The storytelling theory clearly relates to a certain appeal of openness in adoption, in that we try to help our children make sense of their history, their stories, as we write our own together as an extended blended family. The author suggests that for a “happy” family, you should “create, refine and retell the story of your family’s positive moments and your ability to bounce back from the difficult ones.” I can’t say with certainty that telling our family story will offer our daughters anything more than information. But if we can impart important life lessons, confidence and self esteem, a sense of belonging and utility; if we can help our children overcome challenges with strength, resilience and resolve, well then that’s as good as any reason I’ve ever heard to tell a good story. I wrote my last post in response to a recent conversation about adoption. I hung up the phone frustrated and just had to write, though I deleted the part where I vented said frustration since it wouldn’t do any good to publish it. I ended up going in a different direction which was far more civil though sterile (and long, sorry). Something was lost, I think, in my effort to avoid the controversy I would have been courting by publishing the original. Maybe some day I’ll feel more comfortable writing more about that particular situation. Maybe not. For now, I just want to try to address the spirit of what was missing in that post. What is openness to me? Openness is embracing our child’s first family as our own. It’s extending our family to include those who loved our daughter before we ever met her. It’s expanding the very definition of family, not just in theory but in every day practice. Openness is telling our daughter the story of how we came to be her parents. It’s never needing to choose the “right” time to tell her about adoption, because she will always know. It’s creating an environment where she should feel comfortable asking hard questions and sharing difficult feelings. It’s being honest and authentic, always. Openness is being able to see where our daughter got her magnificent locks and luminous eyes. It’s seeing her face light up as she sits next to her kin while they gaze into a mirror admiring their likeness. It’s celebrating those similarities and their source. 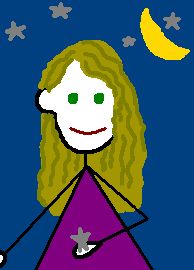 Openness is knowing where our child inherited her unique artistic ability and uncanny memory. It’s listening to stories that tie our daughter to her ancestors, and re-telling those stories until they become her own. Openness is genuinely extending a warm welcome into our lives, not an obligation we fulfill because a contract says so. It’s reaffirming that invitation when someone may need encouragement to participate. It’s keeping that door open for those who have not yet walked through it. Openness is tremendous gratitude that our daughter can share significant milestones as well as ordinary events with family who love and adore her. It’s witnessing the love flowing to and from our little girl. It’s enjoying regular meals with her grandmother. It’s when her grandfather drops off a valentine on his way home from work. It’s always planning our next visit, hoping it comes sooner rather than later. Openness is when our oldest daughter’s first family embraces our youngest daughter too. It’s knowing that family ties are built with dedication, commitment and love that extends beyond blood, woven into a rich tapestry displaying many stories, bold and beautiful, heartbreaking and marvelous. It took some time for my approach to openness in adoption to evolve. At first I had no real idea what it involved, what it was, what it looked like. I worked to overcome my initial fears and insecurities about opening my heart as I learned more about truly child-centered adoption. Then I had to envision and process how openness might work in practice and what it would mean for our family. Today I am still adjusting to the complexity of living in a fully open adoption with our daughter’s family of origin, with all of its joys and struggles. Self education has been key to my evolving views — e.g., from reading books and blogs at the start, to sharing experiences with other adoptive parents, to insight gained from talking with families extended and blended through adoption, especially birth family members and adult adoptees. Of course now living it is my primary source of learning and evolution. I am constantly opening my eyes and heart to the joys and challenges inherent in parenting a child through adoption, and open adoption in particular. This evolutionary process is among the most powerful and important journeys I’ve made in my life (the others being our struggle through loss and infertility to parenthood, and the natural evolution of sharing half a lifetime with a partner). And I’m still on it, every day. Looking back I realize how far I’ve come. It’s hard not to look at people just starting out now and think wow, I wish I could share with you all that I’ve learned. I know everyone on this path has to find their own way, but it helps tremendously to have guidance and support. I was once at the beginning of our journey too, at the start of the learning curve. Back then I wasn’t so sure about the extent of openness we would be willing and able to offer. Early on, I remember thinking we should honor an expectant mother’s wishes about the level of openness she might want for her child, even if she wanted limited contact. It seemed respecting her wishes about her adoption plan was the “right” thing to do. Plus, like many other prospective adoptive parents, maybe I secretly wondered if I wouldn’t have been slightly relieved to have more limited involvement, which would presumably be easier or less complicated. Yet I recognized that line of thinking stemmed from fear and insecurity, and even a (futile) desire to control (and control is merely an illusion). The more I read, the more people I spoke with, the more families I met, the clearer it became that in most cases, openness was best for the child. I knew openness wasn’t possible with every family. But if we wanted a truly ethical child-centered adoption, then agreeing to a closed adoption wasn’t really an option. We found an ethical professional to help navigate the system and ensure support to any expectant parents we encountered (including exploring parenting as an option). Her focus was educating prospective families and expectant parents about a child-centric approach, about grief in adoption, the significance of openness and the inherent value of birth family remaining a significant part of the child’s life. If we met a woman — or couple — who didn’t want the same level of openness, then we could hope they might expand their view or agree that it would probably not be the best “match” for us. I think some mothers (and fathers) fail to appreciate the significant role they have in their child’s life after placement — or sadly, maybe they’re just not afforded the respect and opportunity to fulfill it. Education is critical here, too. Expectant parents considering placement need to know beforehand about the lifelong impact. They shouldn’t be sold the fallacy that they will just “get over it,” presumably after they quietly disappear or assume some marginalized role. Adoption professionals should ensure that expectant parents understand how vital their involvement is. Openness should not be used to lure parents into placement, but rather should be prioritized and practiced in the child’s best interest. This requires real education on all ends of the adoption spectrum — reading about the complexities, talking with families living it, and support for people doing it. When we met the woman who became our daughter’s birth mama, she knew she wanted to remain part of her child’s life. She did not know to what extent that would be possible or likely, and of course she didn’t know what it could look like, or how she would feel after placement. The first professional she consulted, a lawyer, downplayed the significance of openness. When we shared our philosophy — that our future child had a fundamental right to those connections and we had no right or reason to restrict that love, and that we were committed to building a strong relationship — she seemed a bit surprised and at ease. We made it clear that we would welcome ongoing involvement, that it would provide something essential to our child’s well being. While she hadn’t necessarily considered being treated as family, certainly that was our vision. To be clear, this was so much easier once we met, i.e., when we could envision extending our family to this outstanding young woman and those who loved this baby. Thankfully, she needed little encouragement. Reaffirming our open invitation has been an ongoing work in progress. I should point out that it hasn’t been as simple or clear on the other side, trying to maintain openness — at least in spirit — with our daughter’s biological father. We struggled from the start to open the door and establish a foundation of trust. We did finally meet him two times, though we have not spoken with him in over a year or seen him in three years — since before Jaye was even walking. While we do maintain a connection to his mother, our daughter’s other birth grandmother, there is no consistent presence as we’ve had with her maternal family. Still, adoption is hardly a static thing. Our relationships are dynamic, ever changing and evolving. And as our curious intelligent daughter is growing up, her questions are only beginning. So I continue to educate myself about adoption, how it can impact all participants, and how openness can shift over time. I continue to seek out information to help me become a more understanding and empathetic parent to our daughter. 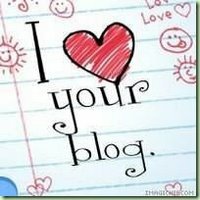 I read blogs and books, I talk with first parents and adoptive parents. I listen to adult adoptees who share their stories, even when they are hard to hear. Because some day that information, those perspectives, may help me support my daughter as she begins to integrate her own story. They already do. These voices help guide as we navigate through complex relationships and issues. They encourage me to take that extra step beyond my comfort zone, to try to make our daughter’s path easier. Each of these things are so supremely important that I’m grateful for the chance to do them. So there’s a boy at Jaye’s preschool. He’s a darling four year old kid, new to the school, very sweet and chatty. He’s my new buddy. Let me back up a minute. Jaye has been going to preschool three mornings a week since she turned three, and she’s never once looked back. Unlike the kids who cry at drop-off and run to greet their parents at pick-up, our Jaye begs to stay longer and go more often. (Aside: We may try two full days to see how she does, but for three days the rates jump so that’s not happening.) When I pick her up mid-day, the kids are usually playing outside unless it’s freezing or storming. I head out back with Baby Z on my hip and we begin the song and dance of what it will take to get Jaye to leave so her little sister can eat lunch before her afternoon nap. It’s tough, because she’s having a blast and the rest of the day isn’t usually as exciting, even if I have something fun planned. Normally I’ll let her play a few minutes before trying to bribe drag coax her out the door. A good sign, really. The girl loves her school. So far, anyway. A couple of weeks ago, we were all playing in the big sandbox when the new boy — let’s call him Dex — came over to us. Dex was instantly drawn to Baby Z and wanted to play with her. He asked lots of questions about her. He wanted to touch (or pet) her. Now Baby Z has quite a little fan club already. All the kids know her. A few have little siblings of their own. Many of the three-to-four year old girls are enamored by the “baby” and her cute little outfits. The two year olds are too small and the five year olds are too busy being big girls. Mostly the boys are too busy being, well, boys. But Dex was different. He was entranced and really trying to engage Baby Z. So I asked Dex if he had a little brother or sister at home. He was such a natural with her, so gentle and kind. His response was equally sweet. And a little heartbreaking. It’s impossible to convey the innocent sweetness in his little voice. It was as if I had asked him if he had any bananas in his lunch bag and he was apologizing because he ran out or something. He did not, because he asked me which one was Jaye. So I introduced them. Jaye agreed Dex would be an excellent big brother. Dex continued to want to play, though I was trying to get Jaye out of the sandbox and ready to go. When Dex asked if he could hold Z’s hand, I nearly shed a tear. This boy was so sweet, so gentle. He followed us inside to say goodbye. Just as we were headed out the door he peeked his head out. “Can I come over to play some time?” he asked. On the way home that afternoon, I couldn’t help but think about Dex’s parents. Did they want another child? Had they tried? Were they still trying? Did they quietly let that dream go? Or did they just want one? I know a number of one child families. Sometimes that was the plan all along. Sometimes the plan changed somewhere along the way. Sometimes the kid came as a surprise. Sometimes they wanted more but couldn’t or didn’t. I know more families — through the blogosphere especially — who wanted more, who hoped for more, who prayed and wished for more. Who tried and tried for more. I wondered which kind of family Dex’s was. Last week I met Dex’s mother, a lovely woman with an easy going manner. I told her how sweet Dex is with Baby Z, what a kind and gentle boy he is. She smiled and said yes, Dex does love babies. He adores them, we agreed, and he’s very good with them. While I didn’t say it outright — I would never, knowing what a sticky subject it could be — clearly he would make a wonderful big brother. I wondered whether Dex himself had asked for a sibling. And did he ask just once, or does he ask often? It’s none of my business, I know. But I just couldn’t read her. I couldn’t tell whether there was longing there, or just something she’s used to hearing. She didn’t share and I didn’t ask. I would never ask. There’s something about this badge of infertility I wear. It’s still there, but no one can see it anymore. So strange. It’s such a huge part of me, who I am, how we got here, how I became a mother, and how I parent my girls every day. It affects most every interaction, especially with other parents. Yet on the surface, it’s invisible. Here I am — seriously, so many years and tears later — with an amazingly clever and adorable preschooler and a cute baby on my hip. Unless you knew my age (can you say oldest preschool mom?) or saw my scars (those things are never going to heal), you’d never know what I’ve been through. You’d never know how many years and how much struggle it took to build our family. How many miracles and dollars and prayers to the universe. How neither child might have ended up as our daughter, yet here they are. It is truly nothing short of a marvel, how our family came together. Yet to a stranger or new friend, we’re just another family of four like so many that came together so effortlessly. Back to our little friend and his mom. I always treasure opportunities to share our story, but I keep it guarded too. I love being able to support someone in the midst of such life-altering experiences — i.e., infertility, loss, adoption, etc. And while I have no idea if this woman is in fact suffering at all, I do know that I too cherish my privacy. I would never presume anyone was in a similar situation or that they would want or need help. Yet I am always listening for clues, looking for openings. If I noticed any sign of anything relevant I would recognize it as an invitation. I remember making little comments here and there to offset probing questions. But I think I was also fishing for a lifeline. At the time I knew so few people in real life to talk with that I would engage anyone who showed the slightest interest. I felt invisible then too. I was always waiting for someone to say “I know, I’ve been there, it’s hard.” So desperate I was for affirmation and any form of support. But you know what I got? Mostly nothing. Awkward silence. Change of subject. Unwelcome advice or assurances. Hence, I turned to the blogosphere, where I met fellow travelers and kindred spirits and felt welcome and heard and supported during the loneliest stage of my life. And I made it through. My goodness, I made it through that darkness triumphantly with magnificent blazing chariots soaring over rainbows. These marvelous girls that brighten my face each day mask the sorrow that once was. They are my invisible cloak now. They shield my badge. One thing my experience has shown me — and there are so many things (really, some day we should list All The Things) — is the significance of support. The impact of a simple affirmation can not be underestimated. It means you are not alone. It means you are not a lunatic or freak. It means someone to help you look at something in a new light. It means someone to share that burden, if only for an instant, to help make it lighter. Real life support is so critical. So why is it so hard to find? I didn’t even write about the six year anniversary of his death. I must have thought I had said it all at five. The anticipation used to be far worse than the anniversary itself. A sense of dread would build as I’d count yet another year without him. As the day drew near, I’d replay those bleak winter days in my mind until I’d feel it in my gut, when I knew my body was failing him, that all hope was lost. I’d re-live it until my stomach twisted and my heart sank and I’d need a reminder to breathe. You’re still here, you still need to breathe, I’d think. He’s gone, but you’re not. Then the day would come and maybe I’d write something or light a candle, or maybe I’d speak only to my heart. Always, I’d think what he’d be like now. The day would be sad yet peaceful. Now, while the thought of him is never too far away, it does seem to get a little farther each year. Never forgotten, of course. Just a little more distant with time and space. Inevitable distance. I used to hold on to that pain, thinking that if I could no longer feel it that he would no longer be with me. As time passed and the space between grew, eventually I became detached from that raw anguish. I know now that is a survival tactic, for self-preservation, yet once the pain of loss was all I had. That lingering grief — as soul sucking and life-changing as it was — was oddly comforting, like the remnants of an old warm blanket. I held it close as it was all I had. To let go would be to lose all connection to my son. I still grieve for our lost boy, the child we never met. For years, I pictured him running with his cousins, playing on the floor, learning to ride a bike, chasing the dog. I tracked milestones and birthdays that would never be. Yet unlike those early years, I no longer weep. I still shed some tears now and again when I think of him, of what we lost. But no longer do I fall to the floor gasping between sobs, clutching my belly as it ached with emptiness and loss. Just over four years ago, I wrote about how my inability to become a mother added another layer of complexity to my grief. Along with our son, I grieved everything infertility stole from me — e.g., the children we would not create, the babies I could never carry and nurture, the family we envisioned. This concept of convergence — i.e., that the sum of my losses merged to form another dimension to my personal grief — made a lot of sense to me. When our son died — as became evident after trying and failing to conceive again — I also lost my chance to become a mother, or so I thought. Seven years since he left us, I have the unbelievable good fortune to be graced by the smiles and laughter of two marvelous daughters. They fill my days with love and light where once there was only darkness. Three years after our son’s due date, we welcomed Jaye into our hearts and I was humbled when she was entrusted to our care. Two years later, I was mystified when my body defied all odds and grew Baby Z for 33 weeks (that’s 12 more than before, a whole trimester). Loving these amazing girls is what made me a mama, or Mama. These words would have brought no comfort then, of course. Nothing could. Only now, with distance and perspective, can I clearly see the impact he left. His existence fundamentally changed me. To start, what I felt for that baby boy helped me to see myself as a mother, even when I didn’t feel like one. The fact that he was here has been neglected by so many simply because they didn’t have to acknowledge his life or tragic death. Perhaps to them he was just an idea, an abstraction long since forgotten. Yet to me? He was my first. He never made it to this world. No photos of him grace our walls. We never gazed into his eyes or heard him cry. But he was real, our baby boy. He was loved. Now, the pain of loss has subsided and the distance is no longer unwelcome. My grief remains tucked away for safe keeping, and I’m OK with that. Still certain triggers can set me back, such as when a family member notes the distinct age gap among cousins or that the boys are outnumbered, or when someone faces pre-term labor. Or when I realize that I’m the oldest mom at preschool and most every kid has an older sibling, when many moms are a decade younger than I am. But mostly I just wish I knew him. Especially now that I’ve met his biological little sister, I can’t help but wonder about this boy. Would he share her mischievous grin? Would their cries and laughter sound similar? In some way knowing Baby Z makes me feel like I might have known him just a little bit better. This makes me sad yet at the same time offers some strange comfort. Recently we inherited something rather extraordinary: a lifetime collection of vinyl records, acquired by a real music lover throughout several decades of her life, beginning in the mid-1950s when she came of age. 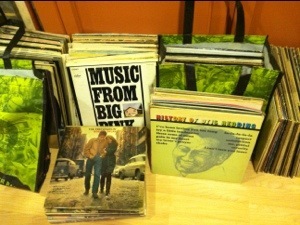 Five bags of glorious wonder now sit on our floor, just waiting to be rediscovered ~ truly an epic collection. The gift was beyond generous and entirely unexpected, though the sudden illness and recent passing of our lovely neighbor has prompted deep discussions here at Casa Luna (our 3.5 year old has raised some fascinating questions and observations – so interesting to watch their little minds at work – but that is the subject of another story, another day). We’ve started sorting through it, taking mental inventory of many gems and surprises. Such a spectacular set of recordings, ranging from the French jazz singers of the 50s to some classic albums from the 60s and 70s – rock, folk, soul and blues, with a definitive San Francisco bent – as well as dozens of classical recordings. I don’t know what’s more astonishing – the scope of the collection itself or how it ended up in our home, so many years after each record was first enjoyed by its owner. It’s such a privilege, really. It sort of feels like trespassing into someone’s historical space. I’m old enough to remember records. I had my own collection, nowhere near as extensive as my brothers’, who listened mainly to 70s rock, or my parents, who listened more to light jazz and rock, folk, Motown and soul. I remember buying records and rock posters for my brothers’ birthdays. They’d usually pull me aside to describe just what they wanted. Back then, buying an album meant walking into a shop — a local one downtown or small chain at the mall. 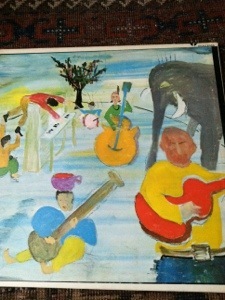 Listening to music blaring while thumbing through row after row of records. I suppose you can still experience some of that thrill buying music in a store today. But let’s face it, there aren’t too many stores left and hardly anyone buys records anymore. Opening up a vinyl LP for the first time, well there was a ritual to it. Some of those magnificent albums with the elaborate covers – when cover art was still a true art form with gorgeous photography, painting, illustration, comics and storytelling – especially those double albums that opened up, well they were just magical. Surveying the songlist and lyrics, wiping the needle clean and letting it drop. The anticipation of listening to that space in the groove when it just crackles before the tune begins. Then again between songs. With so many phenomenal advances in music today, as perfect as a modern recording may sound, some might say that something is lost. 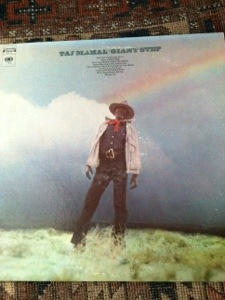 Listening to records just evokes a warm sort of cozy comfortable feeling for me. Perhaps it’s because listening to music then was an all sensory experience – it had to be seen, heard, touched, felt. It was tactile as well as aural. It vibrated. Your sense memory connected to another time and space. The listening experience offered a sense of presence, of purpose or inspiration. As with a wonderful live performance, music would just wash right over you, warming and moving with emotion, transporting you to another place. I bought my first CD player when I was 14, which I played through high school and college. The first thing I did was replace some of my favorite albums. Now we listen to i-Pods and playlists. We download mp3s and stream webcasts. We buy our music online and store it on microscopic electronic cells (and the storage capacity per tiny square inch is amazing). Who knew? 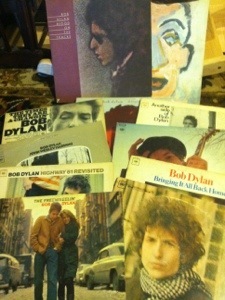 Yet it is still magnificent to behold a dozen classic albums by Bob Dylan, borne of his most prolific years from 1963-1975. Say what you will about him now, but this was his era. Some of these songs are arguably among the best ever written. 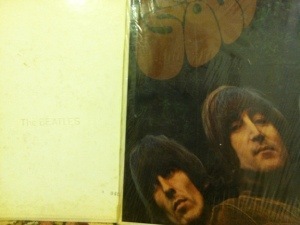 I once had a great collection of Beatles albums, but no longer (why, oh why didn’t I save those?) 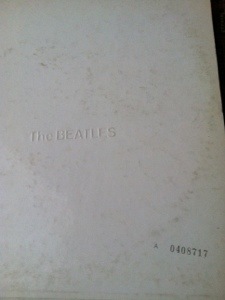 Here’s an early release of The Beatles White Album with “The Beatles” embossed on the cover (it was later replaced by print letters), and Rubber Soul (one of my faves) with the plastic still mostly in tact. And this treasure? 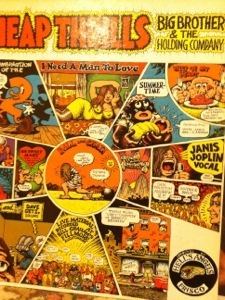 So cool to discover this one featuring early vocals by Janis Joplin with late 60s artwork by Robert Crumb. Here’s another gem. Considering this is one of my favorite concert films of all time – even though Levon Helm was apparently not a fan (Hey Barb, They got it now, Robbie!) – you should have seen my face illuminate when I unearthed this classic. Seriously, I heard the gospel choir sing from my basement floor. Eric Clapton and George Harrison, two of my most favorite musicians from that era, both cite this pivotal album as being quite transformative in their musical careers. 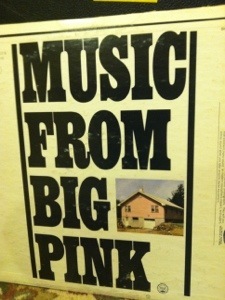 I’ll bet you can practically hear the creaking floorboards of that old Woodstock barn through the vinyl. This may be the first one I need to spin. 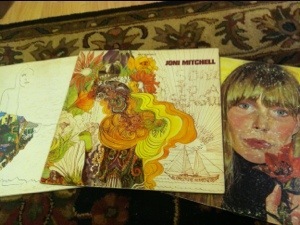 And who doesn’t love a little Joni Mitchell? Wait, don’t answer that. I don’t even want to know. Fan of Emmylou Harris, Joan Baez or Linda Ronstadt? Got you covered. Like, perhaps the complete collections of each. 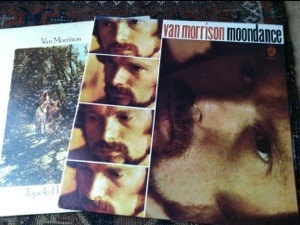 How about Van the Man? Or Taj Mahal. Oh how I loved these. And oh, the soul! Otis Redding has got to be one of my absolute favorite singers. 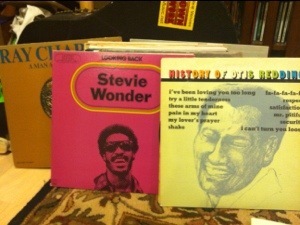 Let’s not forget Marvin Gaye, Ray Charles, Stevie Wonder, Aretha Franklin and Nina Simone. We’ve even got Ike and Tina. It’s supremely difficult to convey the magnitude of sifting through such a treasure, each delightful find making me smile or wonder, knowing it was gifted to us for such pure and beautiful purpose. Poring through these piles you can’t help but sense a lifetime in relationship to music. In essence it is a collection of memories, capturing momentary glimpses in time. Spanning decades of growth, it marks the cultural evolution of one woman but also reflects the world as a whole. These were tumultuous times. 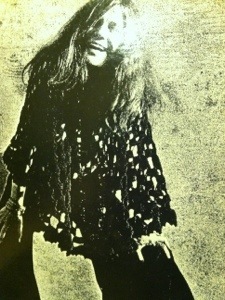 Yet there was profound power in music, both as an escape and to unify. There is very much a sense of yearning for peace through music. I can’t wait to listen to (and re-discover) some of these. We’ve already separated a pile for priority listening. 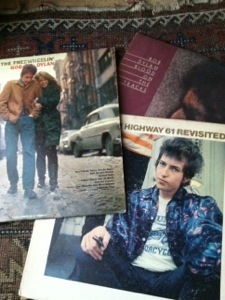 While the records are generally in great condition, they are old and dusty. We’ve pointed out to our daughter Jaye the significance of this collection of old school vinyl, of some of these classics. It was our first real “back in our day” and “they just don’t make ’em like the used to” conversation. I wonder how yet another generation will process such a unique listening experience. In any event, it looks like we need a turntable.